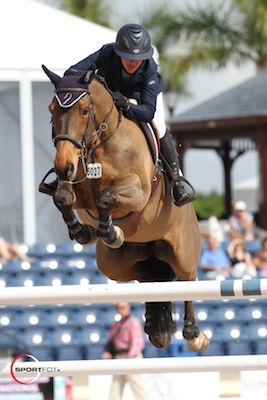 Photo Credit: Lauren Hough and Quick Study won the $31,000 WEF Challenge Cup Round 4 at the 2011 FTI Winter Equestrian Festival. Photo © Sportfot, Official Sport Photographer of the FTI Winter Equestrian Festival, www.sportfot.com. Wellington, FL - February 3, 2011 - Lauren Hough (USA) and Quick Study, owned by Laura Mateo, earned top prize in Thursday afternoon's $31,000 WEF Challenge Cup Round 4 after completing the very close jump-off in the fastest time by just 6/100ths of a second. Richard Jeffery of Great Britain designed today's course in the International Arena and saw eight of the original 54 entries jump clear in the first round. It was a race to the finish in the jump-off as each competitor flew through the timers just moments apart. Beezie Madden (USA) and Coral Reef Via Volo blazed the trail for the jump-off today, setting the opening time in 44.79 seconds, which eventually finished in fourth place. Eric Lamaze (CAN) and Atlete Van T Heike, owned by Artisan Farms LLC, immediately followed and topped Madden's clear round in a faster time of 43.48 seconds, which eventually finished in second place. McLain Ward (USA) and Pjotter Van De Zonnehoeve, owned by Louisburg Farm, were fast but had one rail down to earn four faults in 45.51 seconds to place in eighth. Always a fast contender, Margie Engle (USA) rode Indigo to a clear round next and finished in fifth with her time of 44.87 seconds. Kate Levy (USA) and Vent Du Nord jumped into the seventh position with their fast, clear round in 46.51 seconds. Nick Skelton (GBR) followed trying to catch the target time with Big Star, owned by Beverly and Gary Widdowson, and finished clear in 44.92 seconds to finish in sixth place. Moving their way into third place, Ashlee Bond (USA) and Little Valley Farm's Cadett 7 took a good shot at the leading time, finishing in 44.56 seconds. The final competitor to complete the jump-off was Lauren Hough riding Quick Study. The pair managed to shave the smallest fraction off the lead-time to stop the clock in 43.42 seconds and take the win. Hough was very happy with Quick's Study's performance today since the 12-year-old SFA gelding (by Quick Star x What a Joy) has had time off since finishing fourth at the Gucci Masters in Paris this December. Commenting on edging out the top place, Hough stated, "It was obviously a very small margin. I did not get to see Eric go, but I had a pretty good feel after seeing Ashlee and she was close in second. My horse is naturally fast. After the triple bar I had quite a big distance to the skinny and he is quick in the air, so it was just the smallest 100th of a second margin." "I think Richard did a super job with the course today," Hough noted. "In the beginning I thought that there were going to be too many clear, but it really ended up being what I would call a perfect course. It was not so big today, it was just a nice course for us to get our toes wet and get a feel for it. Sometimes in these classes they have to be careful not to build too big and you end up with 20 clear, so today was just the perfect height and eight clear was really nice." In next week's WEF Challenge Cup, SSG will award a $6,000 bonus to the winning rider if he or she is wearing their SSG 'Digital' Gloves since no bonus was awarded this week. Although Hough was wearing SSG Gloves, they were not the Digital style, and the $3,000 bonus will now roll over into week five. 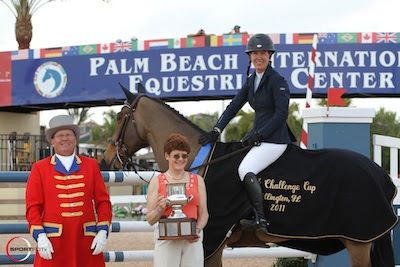 The 2011 FTI Winter Equestrian Festival will host much more exciting competition this weekend as the fourth week continues through Sunday, February 6. Tomorrow's competition in the International Arena will feature the Spy Coast Farm 1.40m Speed Challenge. and for more information please visit www.equestriansport.com.